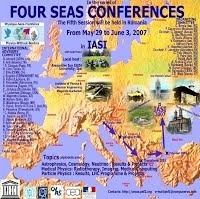 The fifth session of the “FOUR SEAS CONFERENCE” organized by UNESCO, took place in Iasi, between May 29th to June 3rd, 2007. During this week, students from diverse origins (from every country of South-Eastern Europe, but also from the rest of the world) will hear about the most recent developments in Science and Technology. The conference will emphasize the unicity of Science but will focus on different sub-domains which are all “daughters” of nuclear physics and have strong links between them: Particle Physics, Medical Physics, Astrophysics and Cosmology. For each of these sub-domains, the year 2007 will be an important milestone: Particle Physics with the LHC starting operation, a technological and scientific challenge where the place of countries from South-East Europe is not negligible, Medical Physics with its increasing role in the health sector (particularly imaging) and efforts to reach the same level of quality as in the western countries, and finally, Astrophysics with several specialized detectors installed in space. "Seminar on Medical Physics Education in Romania: present stage and expectation"
During universities celebration took place a seminar on "Medical Physics Education in Romania: present stage and expectation" hold in Senate Hall from Iasi between 24-28 October, 2006 and organized by Physics Faculty, "Al. I. Cuza" University - Iasi. A Summer School on "The Physics of Radiation Therapy" organized at Cluj-Napoca, Romania in June (10-14 June, 1999). The host institutes will be Oncological Institute "I.Kiricuta" Cluj-Napoca and "Babes-Bolyai" University Cluj-Napoca, International Organization of Medical Physics (IOMP), the American Association of Physicists in Medicine (AAPM), the Romanian Association of Physicists in Medicine (ARFM) and the Romanian Society of Oncological Radiotherapy (SROR) are the official sponsors of the event. "The 8th National Conference on Medical Physics and ARFM’s Annual Meeting", organized at Bucharest, Romania 1999 by the Romanian Association of Physicists in Medicine (ARFM: Asociația Româna a Fizicienilor din Medicina). "The 7th National Conference on Medical Physics and ARFM’s Annual Meeting", organized at Galati, Romania 1998 by the Romanian Association of Physicists in Medicine (ARFM: Asociația Româna a Fizicienilor din Medicina). "The 6th National Conference on Medical Physics and ARFM’s Annual Meeting", organized at Sibiu, Romania 1997 by the Romanian Association of Physicists in Medicine (ARFM: Asociația Româna a Fizicienilor din Medicina). "The 5th National Conference on Medical Physics and ARFM’s Annual Meeting", organized at Piatra Neamt, Romania 1996 by the Romanian Association of Physicists in Medicine (ARFM: Asociația Româna a Fizicienilor din Medicina). "The 4th National Conference on Medical Physics and ARFM’s Annual Meeting", organized at Craiova, Romania 1995 by the Romanian Association of Physicists in Medicine (ARFM: Asociația Româna a Fizicienilor din Medicina). "The 3rd National Conference on Medical Physics and ARFM’s Annual Meeting", organized at Cluj Napoca, Romania 1994 by the Romanian Association of Physicists in Medicine (ARFM: Asociația Româna a Fizicienilor din Medicina). Seminar on "The Role and Responsibilities of Medical Physicists"
"The 2nd National Conference on Medical Physics and ARFM’s Annual Meeting", organized at Basov, Romania 1993 by the Romanian Association of Physicists in Medicine (ARFM: Asociația Româna a Fizicienilor din Medicina). "The 1st National Conference on Medical Physics and ARFM’s Annual Meeting", organized at Baia Mare, Romania 1992 by the Romanian Association of Physicists in Medicine (ARFM: Asociația Româna a Fizicienilor din Medicina). Annual Meeting of Physicists in Medicine took place during the assembly of all radiation specialists in medicine organized at Cluj Napoca, Romania, May 1991 by Romanian Health Ministry. Annual Meeting of Physicists in Medicine took place during the assembly of all radiation specialists in medicine organized at Baia Mare, Romania, by Romanian Health Ministry. The group of physicists separated from Romanian Association of Oncology and Radiotherapy and decided on them General Meeting (June 30th, 1990), to establish on August 20th, 1990 the Romanian Association of Physicists in Medicine (ARFM) - never legally registered at the Romanian Ministry of Justice and the National Register of ONGs.